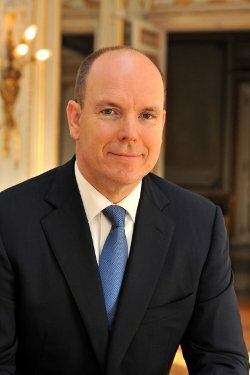 As both a competitor and leader, Prince Albert II, Sovereign Prince of Monaco, has proven himself in sports. In fact, the ruler of the Principality of Monaco since 2005 is the only Head of State who is a five-time Olympian and International Olympic Committee (IOC) member. For his many contributions to the Olympic Movement, the United States Sports Academy has awarded Prince Albert with a 2011 Honorary Doctorate. Albert, who graduated in 1981 with a bachelor’s degree in political science from Amherst College in Massachusetts, has always been an enthusiastic sportsman. He has participated in several sports, including steering in the two-man and four-man bobsled. Albert competed in the bobsled in five Winter Olympics between Calgary in 1988 and Salt Lake City in 2002. Off the icy tracks, Albert has served the Olympics in various leadership roles with the IOC. An active IOC member since 1985, he has served on several committees, including the cultural, marketing and nominations committees. Albert, who holds voting rights on Olympic venues, has also served on the Coordination Committees for the Olympics in Atlanta in 1996 and Turin, Italy, in 2006. In October 2002, Albert visited Miami for a World Olympians Association fundraiser. The group’s mission was to have the 100,000 Olympians get involved with their communities and talk to young athletes about dedication and training. He has served as president of the Monaco National Olympic Committee (NOC) since 1994. He is a member of the Honorary Board of the International Paralympic Committee. Outside of the Olympics, Albert founded the Monaco-New York TransAtlantic race. He is also involved in the Peace and Sport organization, which since its inception in 2007 has brought together decision-makers in politics, sport, economics and civil life to promote peace-building and peace-keeping in the world through sport.